A small screw driver and pointy tool made out of bent wire. You couldn't make them any simpler. 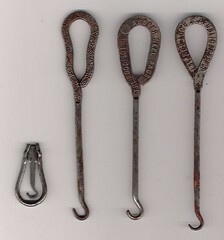 You can see how small the folding hook looks next to these..unless these were meant for gentlemen? The middle one has stamped on it. 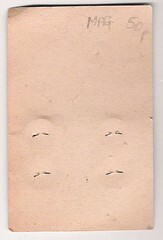 THE WOOD-MILNE RUBBER HEEL PADS. I found all three of these together on Verdin Park boot sale in Northwich. They look like they were mass produced and used as advertising giveaways. 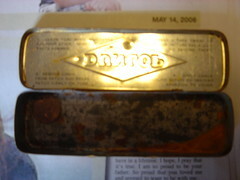 the second one .."WOOD-MILNE SHOE SHINES FINEST PRODUCED." MADEUS. 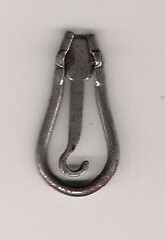 I found this hook in a tea caddy tin on Crewe market. 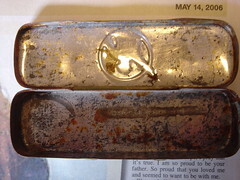 The tin contained an assortment of metal things. 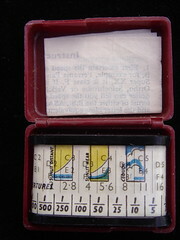 When the hook is folded shut it is only about 3cm long. 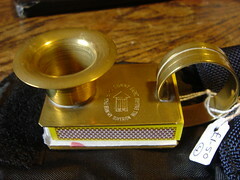 It could have been a button hook, but it looks a bit too small for that. Hook closed...It makes a very satisfying click when it shuts. The elastic band has perished on this one..the propeller is wound up like a childs plane. 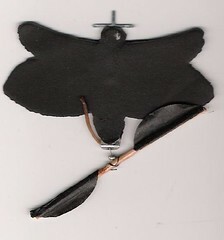 Simply made from tin, wire,a bead,stick and sugar paper. This is a nasty trick. 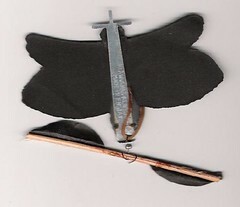 You have to wind it up and place it inside a book or card and it makes the person who opens the book jump as the elstic band unwinds quickly. 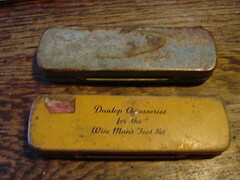 "Dunlop Acessories for the Wise Mans Tool Kit." The writing over the top of John bulls picture seeems to say. 1.CLEAN THE TUBE WITH MOISTENED SULPHUR STICK. WIPE OFF PASTE FORMED. 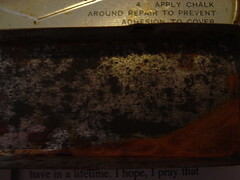 2.SPREAD A THIN SMEAR OF SOLUTION ON THE TUBE AND ALLOW TO BECOME TACKY. 3.REMOVE LINEN FROM PATCH AND PRESS PATCH FIRMLY ON TUBE. 4.APPLY CHALK AROUND REPAIR TO PREVENT ADHESION TO COVER. 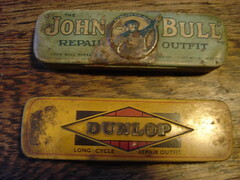 Inside John Bull repair kit. 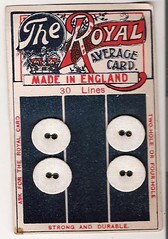 The inside of the John Bull repair outfit. I found a old tin tea caddy today on Crewe Market, it contained a selection of bits and bobs..buttons, cufflinks and suchlike. 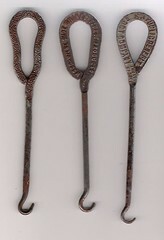 A small crochet hook,Number 5, with the word PROTECTOR stamped on the side. A piece of bent wire that looks like it was bent that way for a reason. 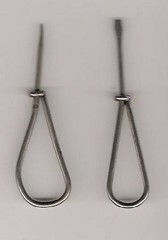 A pointy thing with a bone handle that might have come from a ladies beauty set. Light Metre found on a boot sale at Verdin Park..bought the same time as the flash bulb. 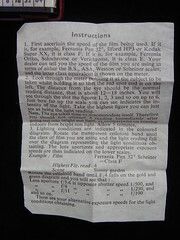 Manual Light metre...You have to hold it up to the light and twist the printed acetate around to the correct spot...looks a bit hit and miss. 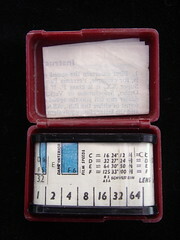 Small plastic box that houses the light metre. The reason I bought the Dunny Light was this great stamp. 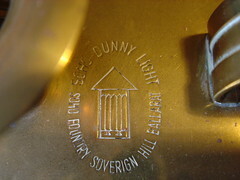 SOHO FOUNDRY SOVERIGN HILL BALLARAT. I think you can see two little feet under the door of the dunny!!?? 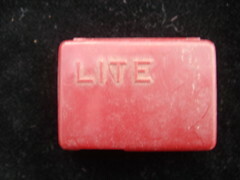 A candle and matchbox holder, found in Help the Aged, Northwich. ASK FOR THE ROYAL CARD. 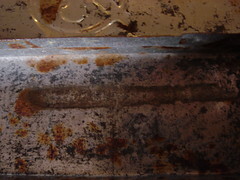 BAck view showing 4 staples. and the price.